Do you have an asphalt driveway? Concrete patio? Has it become dull and dirty over the years? Lucky for you at cleaning maintenance is quick, easy and requires nothing more than a few tools. Below are some hardscape cleaning tips and tricks. We recommend using a long-handled push broom to remove any large pieces of debris and fine pieces of dirt. Try to get any cracks and crevices as dirt-free as possible. If you don’t already own a pressure washer, you can typically rent one from your nearest home improvement store. 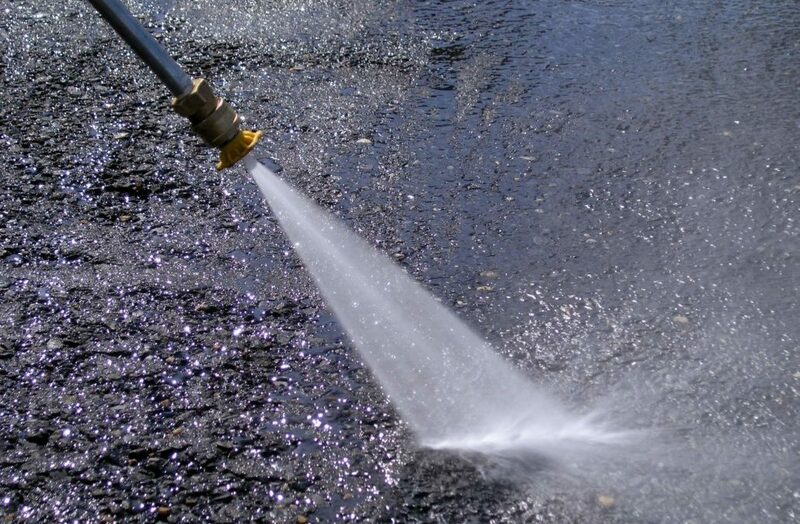 Prep your asphalt or concrete area by covering the area in a gentle but effective pressure washer detergent. Let the detergent soak in for a bit. Lastly, use constant, smooth, sweeping motions to pressure wash the entire area. If your pressure washer doesn’t already remove stains on your asphalt/concrete area, consider the following techniques to get rid of oil, grease, mud and bird poop. •Baking Soda: Douse any oil/grease stained areas with baking soda and give it a few hard scrubs with your long-handled push broom. After allowing the area to sit for a half hour, rinse away the baking soda and stains with a water hose. •Coca Cola: Wipe away excess grease or oil, then pour 2 cans of Coca Cola over the area. Let the spot sit overnight and clean the stain with a fresh cloth the following day. •Laundry Detergent: Saturate the stain with powdered laundry detergent and add a bit of water. Scrub the mixture into the area using a long-handled push broom. Allow it to sit for a half hour, then rinse away with a water hose. To prevent any future staining consider help from our professionals here at Seal Pros Hawaii. We’d love to help beautify your business or residential property. Upload your project details right here to our website and we’ll get back to you with a quote in no time at all.